I mentioned again Monday how much we enjoy the drive through the Tehachapi mountains. We have talked to others that hate that drive. It is a pretty steep climb for an RV or other big vehicle so I understand why some folks do not like it. To us, the beauty of it far surpasses the trouble of climbing it. That is not to minimize the potential difficulties of the drive through the mountains and normally dry terrain. In October 2015 the area received many inches of rain in a very short time. 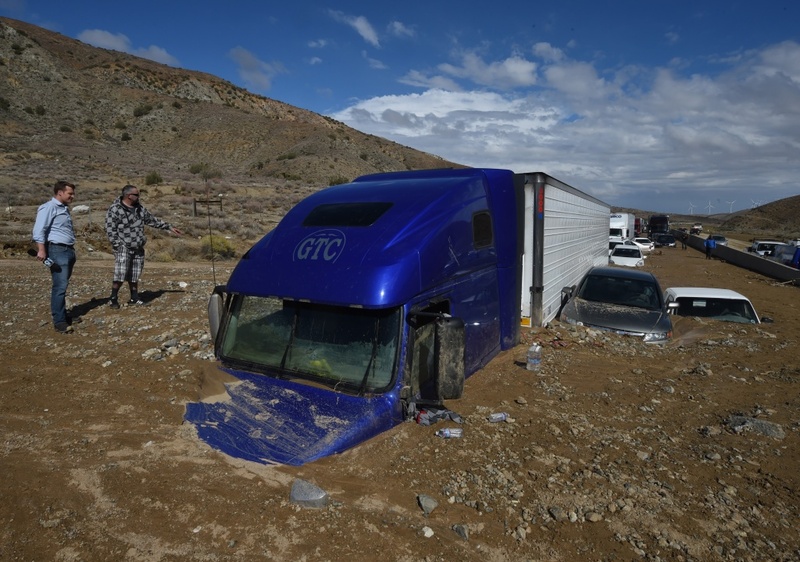 The heavy rain triggered mud slides and nearly 200 vehicles, including 75 semi trucks and 2 passenger buses were engulfed in the mud. 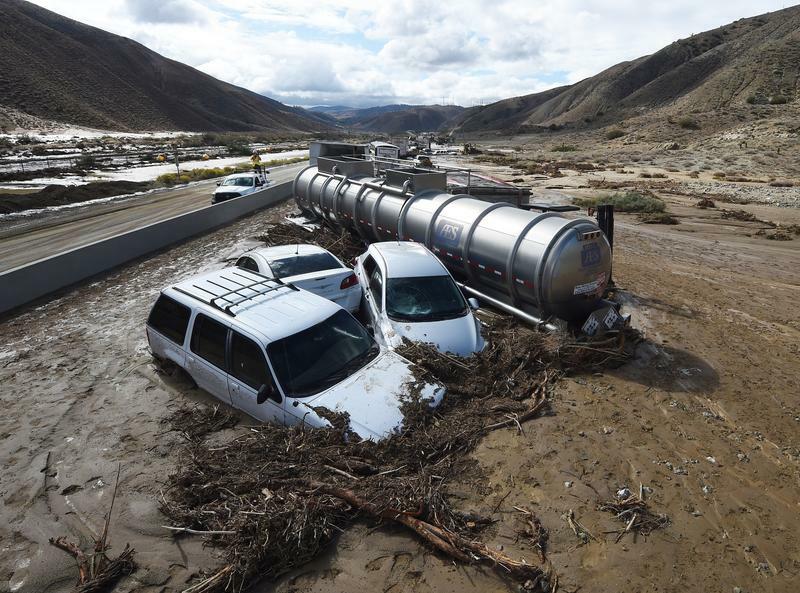 Over 300 people were rescued and the highway was closed for several days. I am pretty sure the majority of those people hate the Tehachapi Mountain drive now. I certainly understand that. We were through there five months later and the only evidence we saw of the mudslide was one closed bridge being rebuilt. We were routed off the exit and then back onto the on ramp. We first drove that route in the fall of 1992. The BoggsMobile at that time was a 1984 Lincoln that had just rolled over 200,000 miles on the odometer. The trunk of that car was huge and loaded to the gills with our "stuff" to live. The back seat was nearly filled with hanging clothes, but had a little place for Odie to sit. We also had a turtle shell luggage carrier on top. It must have been a sight! We have been through the Tehachapi's many times since then in cars, trucks, trucks pulling fifth wheels and the current BoggsMobile. I would say the bus has been over that drive more times than any other vehicle we have driven. In fact, we went through there three times in the spring of last year! One of the most memorable times was in the bus pulling Mr. Cheap Jeep. It was late May 2009. We had left central California after church one night and we were headed to El Mirage, Arizona to begin revival. There was very little traffic and we had made the climb up the west side with no trouble. It was a gorgeous moonlit night with the stars in clear view. As we were coasting down the east side, letting the Jake brake set a nice easy pace and enjoying the view, we heard a "different" sound. The sound was not loud. It was not distinct. It was the kind of sound that you are not sure you are even hearing. The moment I stepped out the door of the BoggsMobile my nose told me it was a tire issue and seemed to be at the rear of the bus on the driver's side. I was surprised when the bus tires were fine. A moment or two later I found the problem. The driver's front tire on Mr. Cheap Jeep was GONE and an inch or so of the edge of the aluminum rim was gone too! Ouch! It took me a minute to take stock of the whole situation but in a few minutes I had the little donut spare installed. I had to finagle things to get the jack in place since the front corner of the jeep was on the ground. But the temperature outside was perfect, there was plenty of light and very little traffic. Two police officers stopped as I was finishing and told me about a tire store about 40 miles south of the next exit. They also told me there was a Walmart across the street from the store where I could spend the rest of the night. Cool! The tire store they directed me to happened to be a Discount Tire. I had purchased four tires at a Discount Tire less than 1500 miles before. I noticed the tread was lose on one of the front tires the day after I purchased them and they replaced it. I have never seen a brand new tire do this. It was not much of a stretch to believe a second tire was defective too. It could have been something I picked up in the tire but I doubt it. However, I had purchased road hazard insurance when I bought the tires so it was a moot point. The Discount Tire we were directed to replaced the tire and we were on our way in a few hours. It was kind of funny when I walked into the tire store carrying a rim ground down on the edges and one thin strip of rubber around the middle. When the counterman ask me how he could help, I held up the sad mess and said, "Can you air this tire up for me?" He groaned out loud at a joke he had probably heard more than a few times. The customers nearly rolled out of their chairs laughing. You have got to know which audience you are playing to for laughs! So one peaceful, beautiful trip through the Tehachapi Mountains had a little glitch, but the key is "little" glitch. It could have been much worse. The traffic could have been horrible, The temperature could have been horrendously hot or terribly cold. Mr. Cheep Jeep could have been badly damaged. We could have been accosted by some one passing by in the middle of the night. There could have been 4-6 feet of mud sliding into the road. It could have been a big deal but it was only a little glitch. And, yeah, we still love driving through the Tehachapi Mountains. Thank you for driving with us.